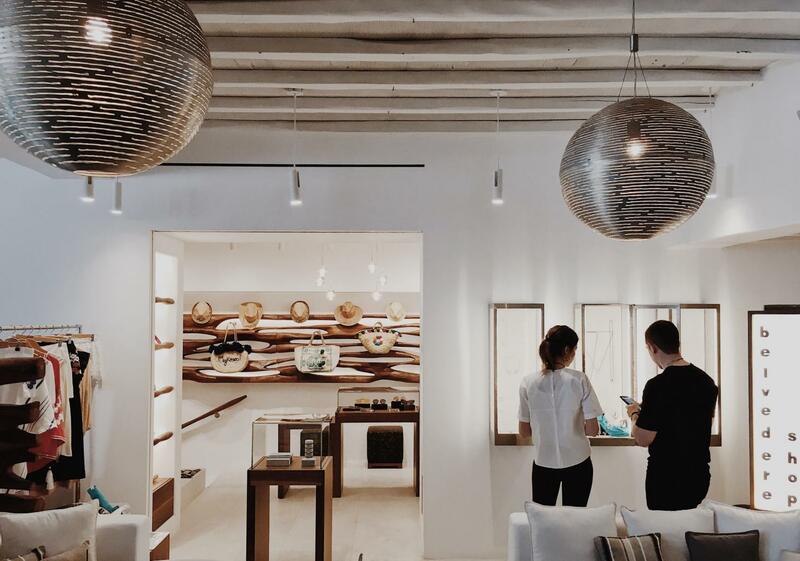 While you are on vacations in Mykonos, you can grab the opportunity to explore the shops. Mykonos is a shopping heaven and here you can find everything from the latest fashion clothes to locally produced delicacies. As the island welcomes thousands of tourists each year, with some very wealthy ones being among them, you will find a lot of stores with a big variety of products. Most of them have a good delivery service either to your home address or your rented Mykonos Villa. 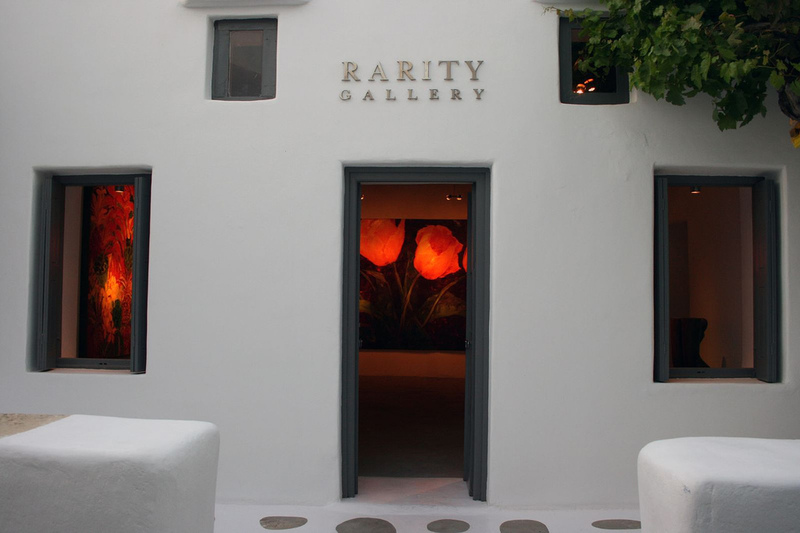 You will be surprised to find out how many famous designers have their own store in Mykonos. Moreover, you will find their newest creations there! Near Agia Varvara church you will find a Luis Vuitton boutique, Dew, Luisa at Nammos, Amnesia, Jardin, a Dsquared2 boutique and an Enny di Monaco store, which bring the latest fashion creations by the most famous designers like Victoria Beckham, Oscar de la Renta, Mugler, Christian Louboutin, Balmain and Alaia. Some other famous brands are found around Matoyianni Square – like Folli Follie, Tommy Hilfiger and Juicy Couture. On Kalogera Street, Linea Piu is another boutique with a great collection of big brand names such as John Galliano, Tom Ford, Blumarine and Chanel. If you are looking for a Greek high fashion designer, try Parthenis boutique at Little Venice and Elena’s Makri boutique. 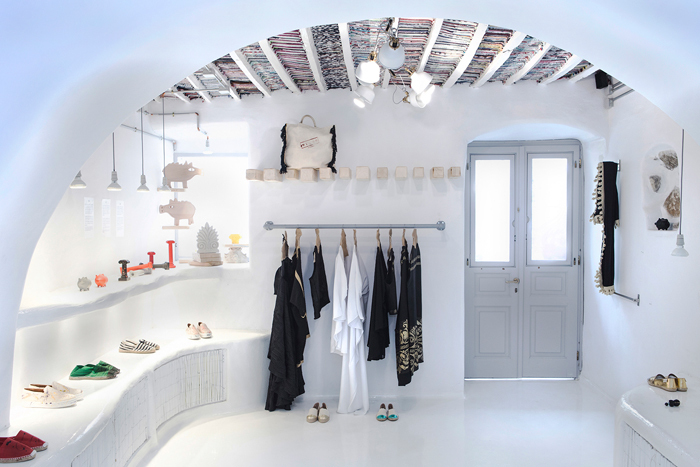 For the younger members of your family, there is a Lapin store on Mitropoleos Street. For a pair of beautiful, Greek handmade sandals you should go to Sandal shop near the Catholic Church. The Big White Gallery in Chora. A spacious gallery that looks like a Villa Mykonos, dedicated mainly to upcoming and famous Greek artists. Dio Horia in Chora. Founded just three years ago, it aims to support new artists and encourage the sharing of ideas. Minima Gallery in Chora. Modern paintings and sculptures by foreign or Greek rising talents. Eden Fine Art at Psarou beach. Pop Art at its best, with more than 25 artists represented here. Rarity Gallery in Chora. Five rooms of contemporary and modern art, mostly paintings and sculptures. Exhibits are made both by famous artists and new, promising ones. Mosaic Art in Chora. Mosaic is only a small gallery but it exhibits replicas of older mosaics as well as more modern designs. It is an innovative and unusual art form for those looking for something a little different to traditional canvas-based creations. Mykonos is the perfect place to buy expensive and prestigious jewellery, as some of the world famous Greek jewellers have a store here. Even if you can’t spend a fortune, you can do some window shopping to get an idea of the latest trends in jewellery. Lalaounis, the designer that had customers like Barbara Streisand, Jackie Kennedy and Maria Callas. His creations are inspired by the ancient Greek history and his collections have names like “Hercules knot” and “Minoan and Mycenaean”. 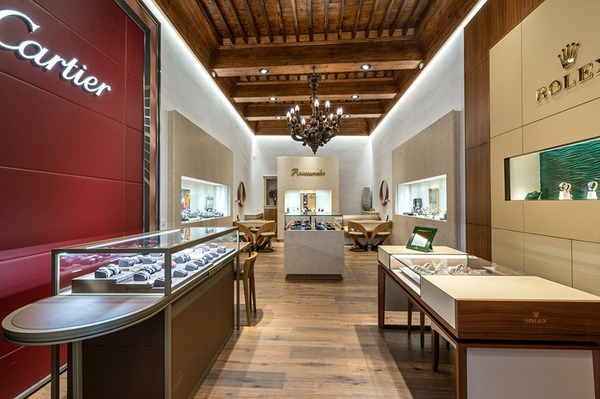 Kessaris, offering luxury Jewelry, watches and accessories, either made by Kessaris family or by other famous designers such as Bulgari or Rolex. The family has two stores on the island, a big one in Chora and a smaller one on Psarou beach. Poniros family also has two stores on the island, one in Chora and one in Mykonos Grand Hotel at Agios Ioannis. Modern collections inspired by the Greek islands such as The Windmills Collection, dedicated to Mykonos trademark or The Volcanic Flower Collection inspired by Santorini’s volcano. Konstantino jewels, known worldwide for their unique design and remarkable craftsmanship. Konstantino’s inspiration comes from Greek mythology, the art of Ancient Greece and the Byzantine era. His creations are timeless and universal due to their inherent symbolism. Every side of every piece is a work of art. Mykonos has its own local products such as Kopanisti (a kind of cheese), amygdalota (sweets with almonds), homemade sausages (flavored with local herbs and spices) and syglino (a kind of dried pork meat). You can find these in most delicatessen stores of the island – such as “Pantopoleion”, “Oh! 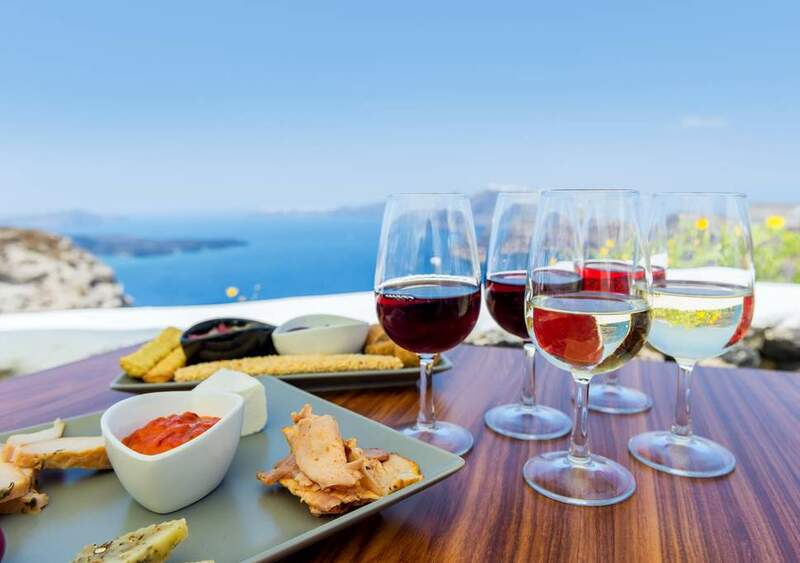 Saveurs”, “Nectar and Ambrosia” and “Aposidi” in Chora and “Piperi” at Ano Mera. “Mastiha Shop” offers a big range of products containing Greek mastiha, which only grows on the island of Chios. Local wine is great and it would be wise to bring some bottles back home. Grab the opportunity to try Ouzo or Tsipouro (Greek strong drinks) and buy some small bottles as souvenirs for your friends. , Amnesia, Jardin, a Dsquared2 boutique and an Enny di Monaco store, which bring the latest fashion creations by the most famous designers like Victoria Beckham, Oscar de la Renta, Mugler, Christian Louboutin, Balmain and Alaia.